The Dividist Papers: GM pays back $6.7B in government loans using $13.4B of government money parked in an escrow account in order to secure $10B in new government loans. GM pays back $6.7B in government loans using $13.4B of government money parked in an escrow account in order to secure $10B in new government loans. All week I've watched GM CEO Ed Whitacre walking down a factory floor in a GM advertisement, crowing about repaying government loans while saying he could respect the opinion of those who did not want to give GM a "second chance". It is good to know that Ed can respect my opinion of the bailout. He might be interested to know that my current opinion is that his claim that GM repaid the loan from the US Government in full and ahead of schedule is complete horseshit. I hope Ed still respects me. I wonder - Does Mike Thompson really believe that anyone beside himself would uncritically take the GM PR, advertising, and administration spin at face value and say "I told you so!" C'mon, Mike. Who would do that? 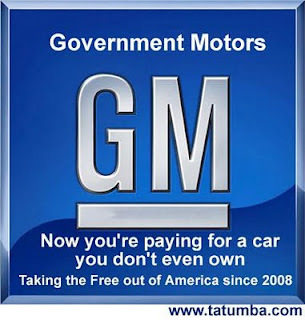 "...the Obama administration handed GM only $6.7 billion as a pure loan... The vast bulk of the bailout money [$49.5B] was transferred to GM through the purchase of 60.8% equity stake in the company--arguably an even worse deal for taxpayers than the loan, given that the equity position requires them to bear the risk of the investment without any guaranteed return." "...the Obama administration put $13.4 billion of the aid money as "working capital" in an escrow account when the company was in bankruptcy. The company is using this escrow money--government money--to pay back the government loan." "...the company has applied to the Department of Energy for $10 billion in low (5%) interest loan to retool its plants to meet the government's tougher new CAFÉ (Corporate Average Fuel Economy) standards. However, giving GM more taxpayer money on top of the existing bailout would have been a political disaster for the Obama administration and a PR debacle for the company. Paying back the small bailout loan makes the new--and bigger--DOE loan much more feasible." I said this was like a carny shell game, but that is not fair - to the shell game. In a shell game a bean is presumed to be placed under one of three cups, and the mark is fooled by quick manipulation of the cups into guessing and betting incorrectly where it might be found. In GM's case, the administration just keeps stuffing more and more of our money into the company's pockets, the company moves some of the money from one pocket to another, gives a little back, and finally both the company and administration that gave them our money misrepresent what is taking place. When all is said and done, GM winds up owing us more money than before they "repaid" the loan.
" It concluded in a December report (which a more recent April report has said nothing to contradict, despite media spin to the contrary) that: "The Treasury is unlikely to recover the entirety of its investment in Chrysler or GM, given that the companies' values would have to grow substantially more than they have in the past." "...it's actually worse than first imagined." In the meantime, as taxpayers, we can take comfort in the knowledge that our money is being used to prop up a failed competitor and make life harder for the Ford Corporation. Ford is a well run American company that took the hard management decisions necessary to survive in a tough environment and made the right management decisions to earn the respect of all Americans. Ford continues to innovate and build new products out of their own capital and profits, not requiring or requesting any government handouts. And we are all paying to subsidize their competitors. We can all sleep better knowing that our tax dollars are being used to undermine a great American company that did the right thing by reanimating their zombie competitors. I guess I'll just have to be satisfied with the knowledge that since GM and Chrysler took my money against my will, they'll never get a dollar from me willingly to buy one of their cars. It's something. H/T to Fausta, who also weighed in with a post explaining how "GM Paid Nothing". The real question, for me, is why does the media for the most part simply regurgitate such a transparent misrepresentation of the facts? Yeah, over the years I've split my buying between the Big 3 as suited my needs, and the quality of their product. But my next new car will be a Ford.